Curiosity nearly killed a kitten in Johnston until rescue crews jumped in to save him. The two-week-old, mixed breed cat is doing well after nearly losing his life Wednesday, according to Johnston Animal Control. “He’s strong, that’s why we named him Soldier,” said Animal Control Officer Erin Medeiros. “He’s going to be our little trooper.” Just before she punched out on Wednesday, Medeiros received a call that the kitten was stuck between two bricks behind a house on Greenville Avenue. The foster parent who’s taken him in said he was dehydrated, but he’s doing better and is adapting well. A family has already adopted Soldier, and will be taking him home in early November. Check this little guy out! Johnston Animal Control was able to save this kitten after he got stuck between two construction boulders for two days!Reporter Chantee Lans will tell you how they got him free tonight at 6. 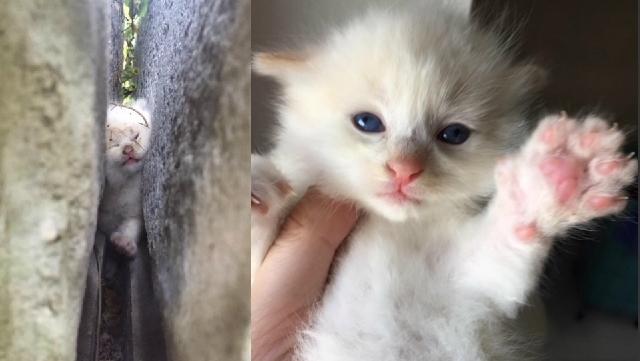 Responses to "Newborn Kitten Spends 48 Hours Trapped Between Rocks Before Being Rescued"